For more than 60 years, Fischer Connectors has helped manufacturers worldwide develop devices that are smaller, lighter and faster. Its rugged circular connectivity solutions help engineers address the latest industry trends, such as miniaturization, high-speed data transmission, sealing, and wearability. Connectivity is a key component of device functionality – if a connector malfunctions, the entire device is paralyzed. The need for highly reliable connectors and cable assemblies that also meet the latest trends in technology is what drives continuous innovation at Fischer Connectors. Named one of PwC’s “Swiss Champions 2017”for its Industry 4.0 approach to R&D, production and logistics, Fischer Connectors invests in technology and processes that increase efficiency, productivity and quality. Headquartered in Switzerland, the multinational has embraced digitized production, improved information flows, and lean manufacturing practices that reduce inventory and time-to-market. The resulting agility allows the company to adapt to customers’ increasingly specialized needs for higher data transmission (HDMI, Ethernet, USB), more power, and reduced weight and space. For example, with miniaturization a driving trend across industries, design engineers are tasked with making their devices smaller and lighter, without compromising connectivity performance. To meet their needs, Fischer Connectors developed the rugged, IP68 sealed and ultra-miniature Fischer MiniMax™ Series. This product line combines signal and power, and includes one of the highest-density connectors on the market with up to 12 contacts in less than a 10-mm diameter. Now available with a USB 3.0 contact block, the MiniMax series is ideal for applications where space- and weight-savings are critical, such as UAVs, hand-held technology and wearable devices. Wearability is another trend in connectivity technology. Engineers must design rugged body-worn electronic ecosystems – e.g. radio, GPS, nano computers, night vision, target acquisition – that integrate into tactical vests and protective clothing. The ground-breaking LP360 connector to be launched in 2018 makes the job easier with a low profile that easily integrates into textiles and 360° mating that facilitates cable management. The kitted equipment is faster and easier to set up, reducing complexity and hassle for the user, while dramatically reducing weight and space. Fischer Connectors is known for manufacturing highly reliable IP68 sealed solutions that resist to environmental stresses in harsh conditions, such as corrosion, radiation, vibration, extreme temperatures and chemicals. The Fischer UltiMateTM Series offers rugged, compact, lightweight, IP68/69 sealed or hermetic, and 360° EMC shielded connectors and cable assembly solutions ideally suited to withstand a variety of severe environmental, industrial and chemical conditions. The Fischer FiberOptic Series is easy to use and clean, even in the field, and offers high data transfer rates over long distances. As for the company’s historical Fischer Core Series, it is ideally suited to fulfill any need in terms of size, configuration and application, with over 20,000 references which include brass, stainless steel, aluminum, plastic and disposable connectivity solutions. Fischer Connectors also produces an extremely tough memory stick specially designed for safe storage and transportation of sensitive data in harsh environments: the ultra-portable, miniature and lightweight Fischer Rugged Flash Drive available in USB 3.0 with a capacity of up to 128 GB. Fischer Connectors’ optical connectivity solutions are also rugged: IP68 sealing easy use, cleaning and maintenance. Fischer Connectors’ miniature connectors (l. to r.): FiberOptic, UltiMate, MiniMax, Core. 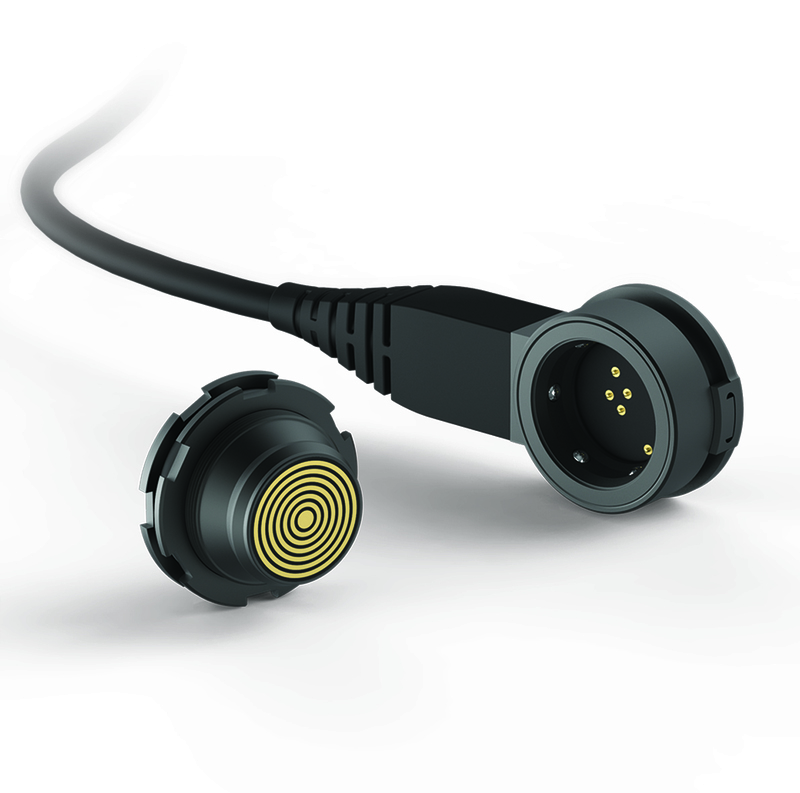 Fischer Connectors’ breakthrough wearable technology: the LP360.